Achieve spectacular patio, backyard, poolside or rooftop décor without investing much money or efforts - transform ordinary spaces into more lively & vibrant ones using our 15 Holder LED string lights! 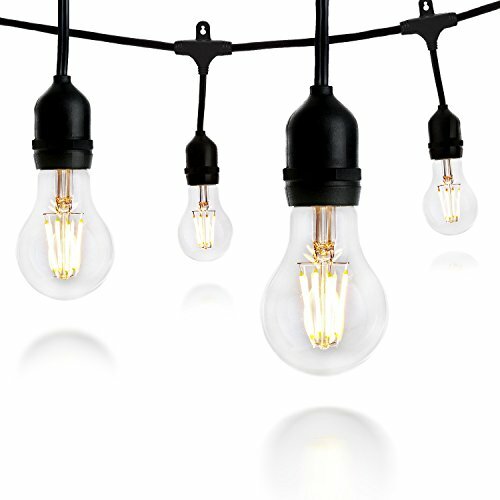 EASY PROFESSIONAL DÉCOR - Uplift the aesthetic appeal of your dull looking patio, garden, pool, backyard or rooftop by decorating your space with Crelitech outdoor string lights - Each outdoor lights string comes with 15 Lamp/bulb holders (E26 Sockets). WEATHERPROOF INDOOR/OUTDOOR LIGHTS - With 49ft length, our light strings are made up of heavy-duty strands with superior insulation & all-weather safety plugs, which can withstand the extreme conditions of summer, winter, rain and even frost or wind! 20 4-WATT LED BULBS - Our Dimmable Patio String Lights come with 20 LED bulbs (5 Extra Bulbs) & a classic form (A19) made up of a clear glass. Each 4W LED filament bulb emanates 440 lumens with 2700K warm white temperature color - enough to brighten up any space. UNBEATABLE PERFORMANCE - For more dramatic effects, you could connect upto 22 such strings of light together (all bulbs with as-in-the-box 4W specifications) using the built-in male-female plugs; even our bulbs consume upto 90% less power! 100% RISK-FREE SATISFACTION GUARANTEE - Crelitech stands for Creative Light Technology & brings to you the best lighting décor solution with 100% risk-free guarantee. Impressive décor for patio or backyard dinner parties is now possible without paying astronomical prices! If you have any questions about this product by Crelitech, contact us by completing and submitting the form below. If you are looking for a specif part number, please include it with your message.